There could be a longer wait for air conditioning on the London Underground as Westminster council don't like the "crude" design of an electricity substation needed to power the Metropolitan, Hammersmith & City, Circle and District trains. The substation is due to be built near Edgware Road Tube station but Westminster Council are likely to refuse permission tonight as they reckon the building will be "injurious to the amenity of the neighbourhood", said the Evening Standard. Wow how bad can it possibly look? Has anyone seen the plans? It's not as if all the buildings around Edgware Road Tube add value to the skyline or neighbourhood. If you look on the whole map, you'll see all of the Heathrow stations simply saying "To other places". Limehouse seems to be just known for Ian McKellen, Camden Town for Goths, Canonbury for Guardian Readers and Kentish Town for Struggling Indie Bands. Dan Zambonini who came up with the idea is looking for people to help him complete the map, so please leave suggestions in the comments or reply to him on Twitter! It's interesting to see the suggestions already being made and how people can associate a whole area of London with an actor or a bunch of restaurants. Some of you will know that I helped to organise Nom Nom Nom again this year, which was basically a blogger's version of MasterChef. It's now time for the public vote and there's some familiar faces to this blog to vote for. L J Rich (you'll remember her from my fab trip on the Orient Express last year) & Jemimah (fab blog post on the day) who made up Team Bork Bork Bork & Cowfish (the evil clue master of the London Transport Museum Flickr Scavenger Hunt) & Eater. I'm sure they would really appreciate your votes! You've got till this Friday to vote! Also we've got lots and lots of scrumptious foodie goodies up for grabs in a charity raffle in aid of Action Against Hunger. They include meals out at Le Gavroche, hampers, wine, BBQ sets, fudge and even a lesson at the Cookery School where the event took place. Tickets are only a fiver and as not all of the prizes have been bid on yet, you're in with a good chance of winning. Good luck! 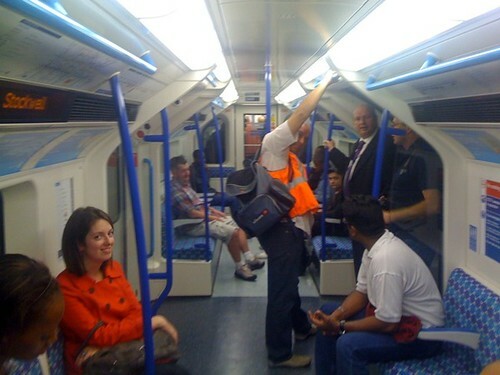 The first new London Underground trains in 10 years have entered the system on the Victoria Line. 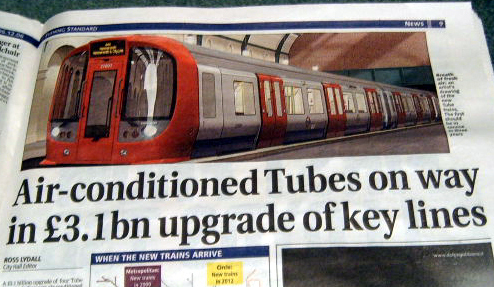 Look out for them as they're gradually being phased in as part of the £750m Victoria line upgrade. 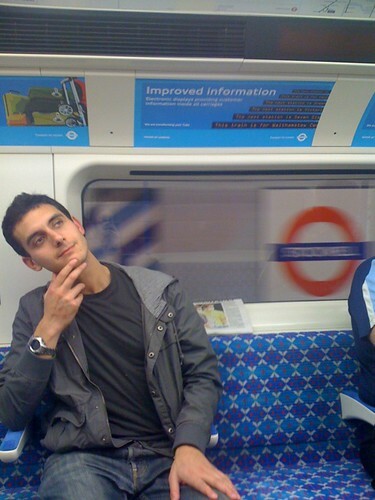 Peter Miller pictured above said "Completely by chance, just had most exciting experience to be had on the Tube - inaugural journey of new advanced train on Victoria line!" Kulveer Ranger, the Mayor's transport director, said: "Londoners have heard a lot of talk about investment on the Tube, but now they can see and experience the reality of the upgrades that they have been promised. The new trains are a fantastic, state-of-the-art addition to the Tube network, which - along with signal upgrades - will transform the journeys of those using the Victoria line." There's more on the upgrade & new trains here. If you manage to find yourself in one, tell us what the journey was like & thanks to Utku for spotting Peter's experience. He said that he managed to outgeek other Tube geeks on the train when he asked them how the signalling worked & how much software would need updating if a new station were added. It's the cheery guys at Warwick Avenue again. 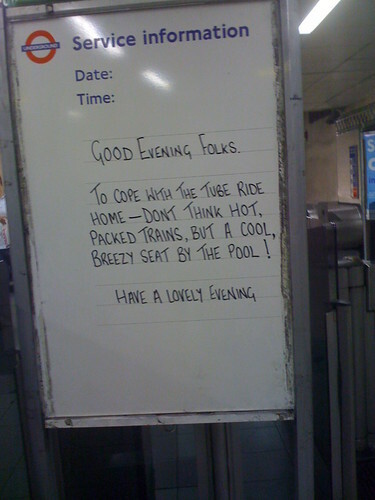 SamCarelse spotted this and said "Some sensible advice from London Underground staff during the heat wave". Thanks to Mags Halliday for the hat tip to this. Plus it's kind of appropriate for me to post today as I'll be going on holiday for the next week, so there'll be a break in posting on the blog. I'll be relaxing on a yoga holiday in the south of France, near the Pyrenees and am looking forward to no commuting or computers. Have a good week & see you again soon. "Had to inform you of a peculiar incident that occurred to me on the 13th July on the Metropolitan line. At Finchley Road, a lady dressed shall we say rather casually (jeans & t-shirt) hopped on the train and proceeded to ask passengers for tickets. Nothing unusual in that you might say, though it's my first time I've been asked for a ticket in all the years riding the Tube. The lady was going through the carriage swinging a Primark bag (!) in one hand and a ticket machine in the other. Everybody on the train seemed to think it was a bit bizarre and questioned whether this inspector was for real. Maybe plain clothes inspectors dressed casually, in this case very casually, disguised as ordinary passengers carrying shopping bags is the latest innovation by TfL!" Occasionally on the District Line I get asked to show a ticket, but it's pretty rare and in those cases, the people asking look pretty obviously TfL dressed. I know there are a number of plain clothes inspectors hanging around stations, but I've never heard of them on the London Underground carriages themselves. I suppose if she had a machine checking tickets, it's pretty hard to fake that & perhaps the Primark bag would have added to the "undercover" look even more. The Most Crowded Train in the World? When you see scenes like this, it makes you tempted (almost) to never moan about an overcrowded London Underground journey again. A Japanese comedian decided to seek out what might be the most crowded train in the world. She found it in India. Thanks to Jon Justice for sending this to me. He said "I don't feel as bad about the Tube now. Oh, I should point out that the female reporter is a comedian and those eyebrows are drawn on and a part of her comedy character. I have no idea why..."
Presumably in this case they might to help catch some of the sweat pouring off her face in that hellish trip. 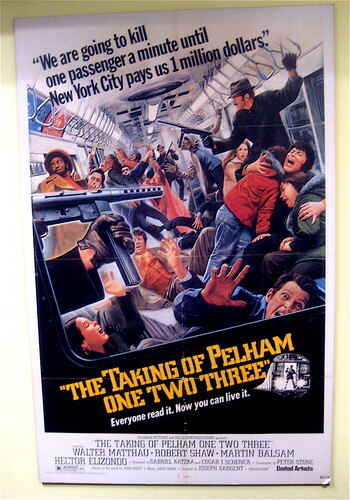 You might have seen posters for a subway thriller starring Denzil Washington & John Travolta on the London Underground. It's a remake of the 1970's film which starred Walter Matthau, about a group of gunman who hijack the carriage of a New York subway train & threaten to kill a passenger for every minute the ransom is not delivered. James Cridland took the picture below & said "I was at a press screening of it a few months ago, and can thoroughly recommend it; New York subway-based action thriller, where the action starts in the first 60 seconds and continues until the end if the film. Never a dull moment." 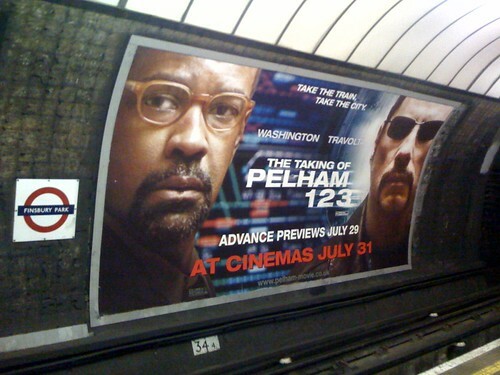 I noticed some poster sites on the Tube also have short clips of the film built into the advert's hoarding. I wonder how much effort the film company had to go through, persuading CBS outdoor & TfL that these film shorts wouldn't put people off travelling on the Tube? Times have changed from when the poster for Tube horror film Creep was temporarily banned in case it "frightened customers". 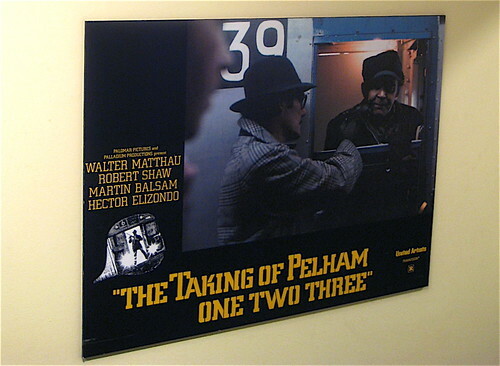 The Taking of Pelham 123 will be out nationwide from July 31st, let us know what you think of it. 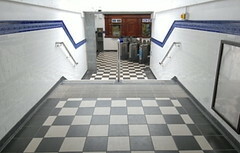 Transport for London are running a photo quiz where you have to name 10 London Underground stations from picture clues. It seems to be much harder than you might think as they've had nearly 100 entries but so far only one person has got all ten correct. I'm sure readers of this blog will be able to do this easily. In fact I'm pretty sure even I know all ten, but only with the help of the clues. You can enter the competition here as there are prizes (a trip to the London Transport Museum) for the first five people who get all ten by July 31st. One of the first augmented reality apps to go live in the iPhone AppStore is an amazing app for finding your nearest London Underground station. Acrossair have brought out a magical app that directs you to nearby Tubes in a wonderfully visual way. "By tilting the phone upwards, you will see the nearest stations: what direction they are in relation to your location, how many kilometres and miles away they are and what Tube Lines they are on. If you continue to tilt the phone upwards, you will see stations further away, as stacked icons." It's only available to Apple iPhone 3GS users and almost makes me want to get one. Thanks to sizemore & Jon Justice for the heads up on this. I can't even pretend to understand the technology or "the science bit" behind this. So I'll leave Engadget to explain how it came about: "With the iPhone 3GS pimping an improved camera, in built compass and GPS, we had a hunch that it wouldn't be long before someone slammed them all together and gave commuters and tourists alike a reason to smile." Wonder what station this large pigeon was perched at? The London Assembly Transport Committee investigation kicks off with a public meeting today and is looking at how well (or badly) TfL is managing both overcrowding and the upgrade programme on the London Underground. Things they're investigating include: what impact overcrowding and line closures have on our journeys, and on other modes of transport. Also how satisfactory are the alternative travel arrangements on offer when lines or stations are closed on weekends so upgrade works can take place? The investigation will look in particular at the impact of weekend closures for engineering works on the Jubilee line, on both passengers and on venues along the route like The O2 and ExCel. Can lessons be learned or could TfL take an alternative approach to future upgrade works, especially on the Piccadilly line, which normally carries around 800,000 passengers on weekends? It would be really helpful if you could fill in a short questionnaire of your experiences and also feel free to leave comments about weekend engineering works and overcrowding below. Union leaders from Unite rejected a "final" pay offer today, so 600 London Underground engineers and electrical workers are going to be balloted for industrial action. Unite's regional officer said today "London Underground presented this as a final offer (two year offer of 1.5 per cent in the first year and RPI plus 0.5 per cent in the second year), indicating to us that they are no longer interested in negotiating. "In these circumstances we have no other option than to ballot our members on industrial action with a recommendation that they vote in favour. "Unite would welcome further discussions should London Underground wish to return to the negotiating table." As the members are responsible for safety, maintenance, management and power control, any industrial action would stop the Tube system from running. 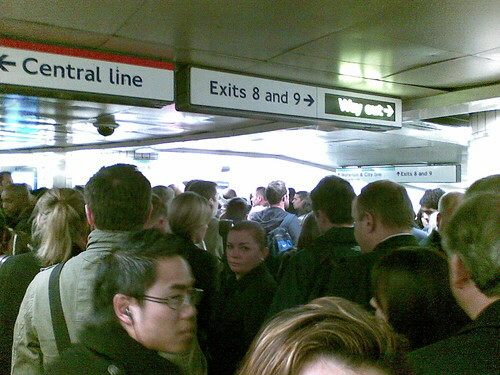 We're still waiting to hear about the RMT & London Underground's ongoing dispute over pay and job losses. 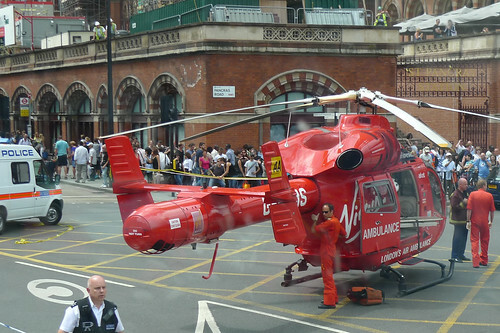 Four years ago today, 52 people were killed in bomb attacks on the London Underground and a London bus. In memory of the people who died, a £1 million permanent memorial will be unveiled in Hyde Park later today. It was a day most Londoners will never forget and fitting that there's now a permanent place to mark the names of random people who were going about their everyday commutes, never knowing it would be the last journey of their lives. My thoughts are with the families of those who died and also with the many people who were injured in the attacks. If you've ever wanted to find out what happens to people on a London Underground train when there's a person on the line, there's a interesting blog post from Andrew Jaffe. Yesterday lunchtime, trains weren't stopping at King's Cross station because of a "one under" - horrible phrase, but that's what Tube staff call it. Andrew said, when the driver were informed of the incident "After a few more minutes he told us that we may have to 'de-train' but that he'd let us know when authorization came. He implied that if the unfortunate victim were still alive it could take up to a couple of hours. 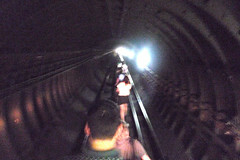 After they walked through the tunnel to the next station. 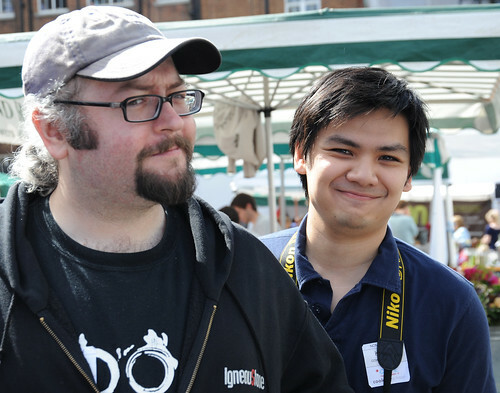 Andrew said: "We got loaded onto buses and made it into central London. On the way, I passed Kings X station itself, to find the (Virgin!) Air Ambulance ready to rescue the 'person under the train'"
"If nothing else, the British (and, I think, even we foreigners who happen to have found ourselves here) tend to be pretty relaxed in a crisis, and so we were. Given that this was on Sunday in July, we were lucky that the train wasn't much hotter and more crowded with people commuting to work, so we could manage to be more amused by the situation than anything else. Damped, to be sure, by the sad circumstances that had caused all of this. But still: blitz spirit, Keep Calm and Carry On, and all that." There's more pictures from the evacuation on Andrew's Flickr set. Funnily enough only last week Ianvisits sent me a link to a post about the length of time it takes to re-open roads and railway lines, if there has been a fatality or person on a line. "Lord Faulkner said the British Transport Police, 'which is primarily responsible for dealing with the sort of incident on the railway to which he refers, has a remarkably good record in getting lines open again. 'It has a target of 90 minutes; last year it exceeded that and achieved a reopening time of 76 minutes, and I am told that it hopes to do better again this year." It's an awful thing having to balance the speed of getting people on their travels again, with the sensitivity of telling people what's being going on. I'm pleased that Andrew said in this case, the evacuation went smoothly and people were quite relaxed and understandable. However, in the rush hour, I've heard loads of people tutting and getting really hot under the collar when a person on the line causes problems to their journey. Isn't it easier as Andrew says to "Keep Calm & Carry On" and have a bit of sympathy for the people involved? 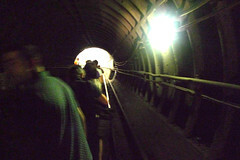 Fortunately next year, some of us might have some relief with the air conditioned Tubes when they are rolled out on the Metropolitan Line. But with deep level lines there's still no hope for cooler Tubes as Boris Johnson says "The difficulty is of course that it will ramp up the public pressure on us to deliver air-conditioning on the deep lines as well." Each year we hear that TfL are working on cooler Tubes (when Ken Livingstone was mayor he offered a six figure reward for someone who could come up with a solution) and each year we swelter on deep level lines. Maybe one day, we'll see it, but until then it's a case of sweating and bearing it. It could be a new advertising campaign. 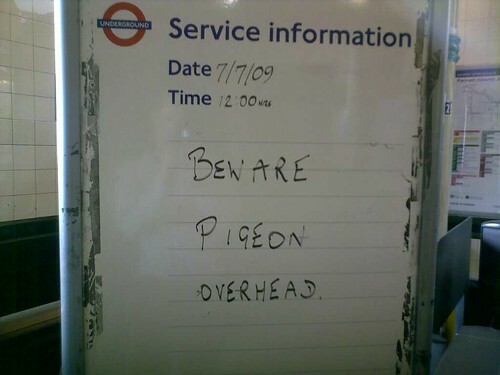 It could be a message from the London Underground. 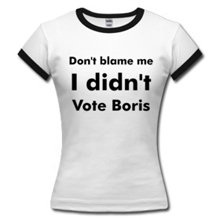 It could be message from Boris. 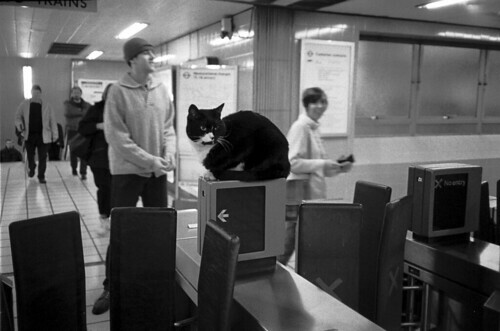 But I loved this photo that Mister Rad took at Bond Street Tube station. Mister Rad said "This person decided to ignore it ... but an evil plan like this was bound to attract some attention!" 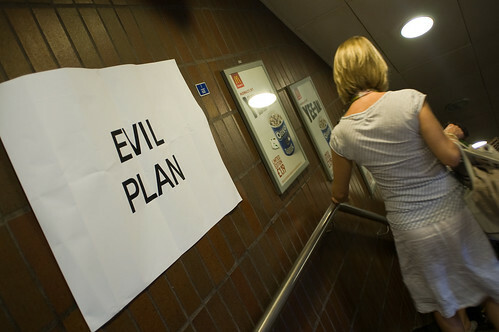 If you happen to see a Dr Evil look-a-like on the Tube hastily putting up posters let us know. It's funny how even Transport for London and the London Transport Museum, see London beyond zone one as the "Outer Limits". But if you think there's more to London than Zone one and have a eye for design you could have the chance of changing this and bagging yourself a thousand pounds too. "Continuing the tradition of commissioning cutting edge poster design, London Transport Museum and Transport for London (TfL), along with partners London Design Festival and Visit London, have launched an open competition to design a poster that celebrates the discoveries, pleasures and excitements that London has to offer beyond the city centre. 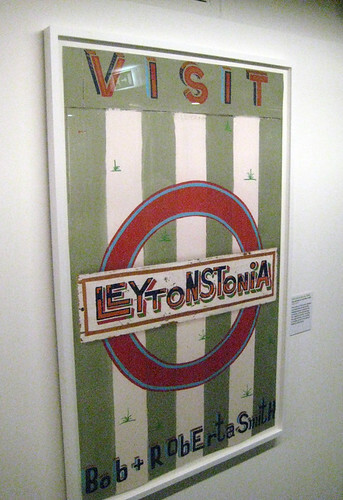 The winning design will become part of London Transport Museum's collection and will be reproduced as a poster for display on TfL's transport network. Entrants are encouraged to use all variety of media and current technologies to create their take on contemporary poster design to reflect London's position as a leading design capital City. 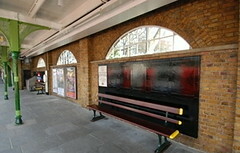 The poster must work within the contemporary display contexts of TfL's busy public environments and should conform to the rules and conventions of public display. It is important to remember any piece of advertising design will only have 3 seconds to attract the attention of a passer by." 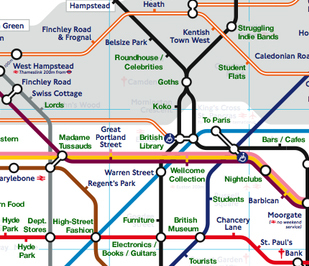 Full details and a list of prizes are on TfL's site. I've heard that the competition organisers are particularly interested in receiving designs that feature modern life in the following London boroughs: Barking & Dagenham, Barnet, Brent, Camden, Ealing, Hackney, Hammersmith & Fulham, Harringay, Harrow, Islington, Newham, Redbridge, Richmond, Tower Hamlets, Waltham Forest and Wandsworth. Maybe these areas are under-represented in the Tube's current posters! You have until July 27th to enter. Good luck.